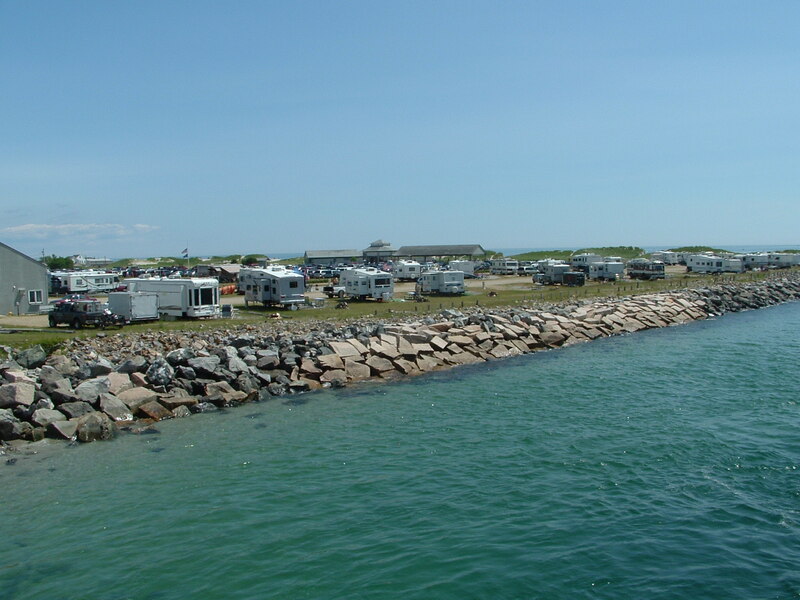 Hampton Beach State Park RV Campground is a small RV-only park located directly on the Atlantic Ocean on NH Route 1A in Hampton Beach, New Hampshire. The campground itself is nothing special… gravel roads, no trees, no shade, no amenities, but plenty of cool breezes off the ocean. In fact, most campers leave their awnings up… it’s fairly windy most of the time here. We arrived last July 1st for a week long holiday stay. The campground office was locked so we went directly to our reserved site and set up camp. We had an unobstructed view of the Atlantic Ocean. The weather was absolutely great… low 80’s with a nice ocean breeze all week long. All campsites are gravel, level and comfortably large with full hook-ups. Even the largest RVs will have plenty of room here. While there is no cable, your antenna should pick up more than a dozen channels clearly from Boston, Providence, Portland and Manchester. There are no on-site amenities… no camp store, no laundry, no playground, just campsites. Adjacent to the campground is Hampton Beach State Park which does have a small store with some snacks, ice cream and bagged ice, but that’s about it. If you need anything, head down the “strip”. You’re bound to find it there. So what’s so great about this park? Other than being directly on the ocean (if that’s not enough! ), it’s just a short walk to the Hampton Beach strip… with more food, shops and entertainment than you can take even if you stayed here a week! Grab your umbrella and towels and head for the beach, it’s only a minute from your campsite. Walk along Hampton Beach Boulevard and smell the fried bread dough, pizza and french fries. Listen to the bells and whistles of the nearby arcades. At night, grab your chairs and head down to the beach and catch the fireworks. Summers are great here! Spend some time exploring Massachusett’s north shore or head a few miles north to downeast Maine. There’s plenty to see and do nearby. This past July was our 17th visit to Hampton Beach RV Park, and we’ll be back again this summer! 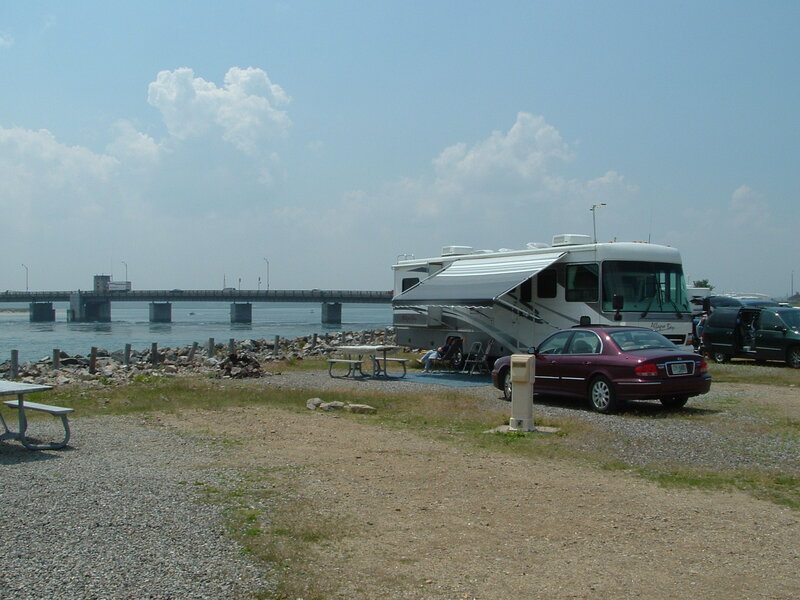 Sites at Hampton Beach RV Park are usually booked a year in advance. Your only chance is typically when the is a cancellation… but those are scooped up quickly. They do have an overflow area in the adjacent State Park parking lot (no hookups) if you don’t have a reservation. I agree. The campground itself is not too much to look at, but boy what a view!